The last few months have been up and down with my health. I realized after being in the hospital for the second time a couple of weeks ago that I needed to start taking better care of myself. I always try to cook from scratch, but I tended to grab the baked goods that I made rather than protein snacks. So in the last couple of weeks I have re-done my snack routine. Gone are the cookies and sweets that I would love to be able to enjoy all the time. I've realized that I've finally got my potassium back up and I would like to keep it that way. Therefore I have started eating more fruit and having protein with all my snacks. It has been a learning curve for sure, I would love to say that I enjoy bananas and milk, but it's a struggle. I do love nuts, peanut butter, and cheese, so increasing my protein has been relatively easy. Recently, Redbook Magazine had a recipe for Sweet and Spicy Cashews, which looked easy and full of flavor. This recipe has 5 ingredients. It takes 10 minutes of prep and 40 minutes of cook time and makes 3 cups of nuts. With only 5 ingredients I had no problems finding any of the ingredients at my local grocery store and made no modifications. I did find that I had to turn the nuts more than the once suggested by the recipe, otherwise they would have burned. Additionally, I found that the temp was too high to put the nuts in for 40 minutes. I either suggest turning the oven down to 275 degrees or lessening the cooking time. I followed the remainder of the recipe as written. Nuts are a great source of protein, but plain roasted nuts can get boring. This recipe was a great break from my normal roasted almonds routine I liked that the Chinese-five-spice and cayenne gave the recipe a slightly spicy taste, while the sugar made the cashews sweet. Overall, a very simple nut recipe that's full of flavor. For the recipe go to Sweet and Spicy Cashews. 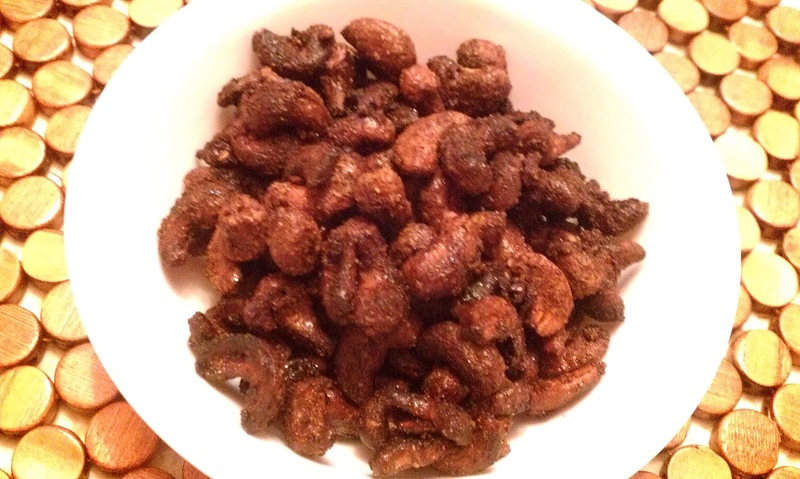 We often eat, enjoy cashews since they grow here in abudance. I love to use those nuts while cooking too. Spiced variations r more of my husbands liking. But spiced cashewnuts will be defently good for ur health. in general spicy food can help u in many ways. Sweet and spicy cashews just sings "wonderful" to me. I don't go so hot I burn my lips but I'm definitely going to try these. I don't go super hot either, just enough for flavor! Thanks :) The flavors were great! These sound great. I hope you continue to feel good! Thanks :) I am feeling much better every day! Thanks for the follow, following you back :) Have a great weekend!